After co-writing 10 thrillers with Lynn Sholes, Joe Moore has started a new action/adventure series that introduces Matt Skyler, a marine salvage expert specializing in military recovery. Skyler is the director of OceanQuest based out of Key West and, among his numerous accomplishments are the raising of a Russian sub off the coast of Bermuda and an ancient Roman warship from the bottom of the Nile. Skyler thrives on solving the impossible. A Soviet nuclear submarine flying a skull and crossbones kicks off this gripping international thriller! This adventure started when Matt Skyler stepped onto the windswept deck and filled his lungs with fresh ocean air. Alone, he stared out at a moonless night. The stars washed across the heavens and glistened off the water. A flash of light caught his attention. A large object moved on a parallel course with the ship—it blocked out the reflected starlight. Skyler made out faint white lines of foam curling along its edge. His eyes adjusted and his pulse quickened. It was something he’d seen before on another night, another ocean. The low round profile with its slight humped back, the tall stark tower topped with antennas, and the tail fin that cut through the water like a shark’s. There was no mistaking the distinctive profile of the Yankee-class Soviet nuclear submarine. It bore no markings, only a single black flag flying from the tower. Its insignia—a white skull and crossbones. 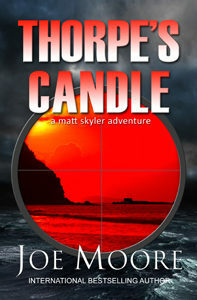 THORPE’S CANDLE is available in print and ebook from Amazon and Barnes & Noble.